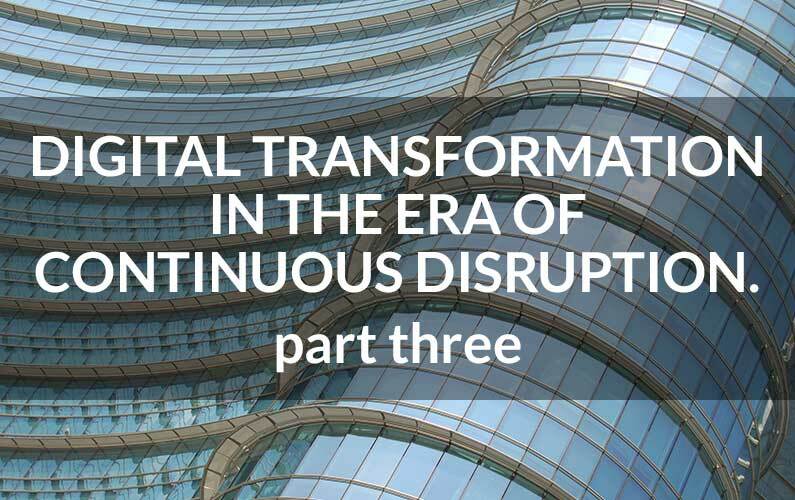 In our series on digital transformation, we’ve recently explored how to thrive in the era of digital disruption as well as how to rethink digital transformation strategy. In this, the third blog in our series, we continue our focus by moving on to the execution side of digital transformation and the importance of orchestration. In the world of digital transformation, orchestration is about a lot more than simple project and program management. Due to the complexity of digital transformation initiatives and the fact that they have impact across such a broad range of strategic objectives, people, processes and technologies, proper orchestration of your initiatives can often mean the difference between success and failure. In recent years, digital transformation has clearly become a team sport among the C-Suite with many C-levels collaborating closely to develop and execute their companies’ digital agendas. What started as the purview of the CMO, has now expanded to look well beyond digital marketing and to how companies can re-think and re-design their entire business models, processes, products and services. The evolving role of the Chief Digital Officer has morphed from the earlier marketing focus into something far-more expansive – reaching into corporate strategy, innovation, technology and operations. Correspondingly, digital transformation initiatives need to be carefully orchestrated to take a holistic view across the various strategic initiatives of an organization as well as to coordinate and collaborate with all key stakeholders. Since many digital transformation business models are built upon cloud-based, industry-specific platforms, such as the business models of GE Predix and Philips HealthSuite, it’s important to orchestrate your digital initiatives, not only internally among stakeholders, but also across your extended partner ecosystem. A key part of the power of the platform business model which many organizations are undertaking is that it enables customers and partners with the freedom to innovate (i.e. “permissionless innovation”) on top of the platform and to create network effects and a virtuous cycle for the business model where value is continuously added over time. With the digital customer experience at the heart of almost all digital transformation agendas, the customer journey is clearly one of the first places to ensure clear coordination. In this case, we’re talking about a seamless, orchestrated user experience that’s efficient and effective in its design and implementation regardless of the pathway the customer takes through their journey. With omni-channel initiatives evolving into so much more than coordinated touchpoints across physical and digital channels, it’s important to orchestrate the full user experience so that whatever pathway the customer takes from browse-to-buy or from source-to-pay the experience is elegant and intuitive. Orchestrating technology is about more than integrating systems, applications and data, it’s now about how an organization orchestrates some of newer, enabling technologies in powerful combinations with one another to create unique, new value propositions for their customers. We typically think of this as “digital experience essentials” (i.e. social, mobile, analytics and cloud) as well as “digital experience enhancers” (i.e. AI, blockchain, IoT, workforce of the future, next generation cybersecurity and others). It’s these digital experience enhancers that are becoming the new battleground for carving out unique new business models and value propositions. Finally, orchestrated delivery is about more than project management and ensuring timely project completion, it’s now about how you design, develop, deploy, manage and maintain your digital solutions and services – and how you do so on an ongoing basis – with continual innovation throughout the process. Our perspective is that while techniques such as agile and devops are great as standalone capabilities, they’re even more powerful when orchestrated together to provide a full lifecycle approach to continuous innovation in digital services. That way you can innovate for customers – but do so repeatedly and make digital transformation an ongoing journey rather than a destination. At ClearPrism, we don’t claim to be experts on every aspect of digital business, but what we specialize in is in assisting you with the strategy and planning associated with digital innovation, building a business case around your plan, and then driving ownership to maximize the value of your entire transformation journey. Through our ClearOrchestrate Services we bring together the “best of the best” through our people and our vetted partner network of companies that are experts and specialists in their respective digital focus areas. In much the way that a conductor orchestrates the musicians performing a symphony, we bring all the players together to make beautiful music. Or in our case, talented professionals to achieve total clarity and success so that you can thrive in a new digital business climate. In addition, we believe that providing governance and risk management in digital transformation is key. The areas where we bring deep skills are around the governance and management of the execution as well as the management of the risk. Capabilities such as our Active Matrix tool are integral to our risk management approach for large programs and help us ensure close alignment between strategy and execution.